Treasures of Rome is rated 3.2 out of 5 by 25. Rated 5 out of 5 by denniann2 from travel through rome this is an uncomplicated M3 with super power ups that will help you as you advance through the levels. you probably won't need them until you get up to the higher levels. bank your money and unlock them as you go, but it really costs to use them so i would wait to do it until you absolutely have to. you have 4 power ups and they work well!!!!!! there is 100 levels so it is not a quick game. ehjoy!!! Rated 5 out of 5 by Rita1955 from Love the game. Had problem with it running, it looke's like a great game. Rated 5 out of 5 by pennmom36 from Worthy Match 3 This game reminds me of the Cradle series, maybe it's because of the Roman theme, but it kept my interest for the entire demo. Whilst you fought at the side of Caesar for the glory of Rome, the evil Marcus kidnapped your beautiful wife Altana, so there's no time to rest your war weary body. 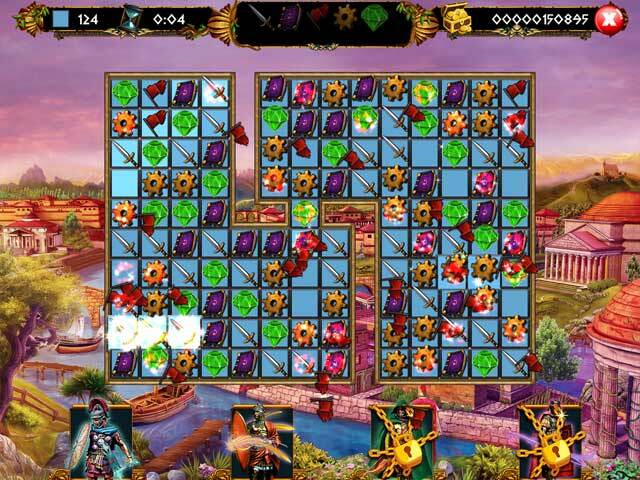 You must deploy the help of legendary Romans to help you during your quest, and gather enough gems to pay their wages. If you make matches of 5 or more tiles, you will receive either a bomb or lightning on the board which will explode when clicked destroying several tiles. As you progress, you will enlist the services of great warriors and marksmen such as Dracus, but it will cost you 45,000 Sestertius to unlock his services and another 12,000 each time you require his services to make all matches of whichever tile you choose. Lanius can clear an entire row, his cost to join you is 27,500 Sestertii, and another 4,500 each time you need his services. Bowman Philipus will join you for 70,000 and will require another 18,000 to use his arrows which are like miniature bombs, Spearman Fighterus needs a whopping 105,000 Sestertii for his deployment and another 25,000 to use his spear to destroy all of the tiles on the board (why not just use him, clear the board, game over!) Some tiles are blocked with rocks and boulders which take at least one match to clear the rocks, some are blocked with chains and even double chains, again requiring at least one match of whichever tile is chained, to break. You need to make matches on top of every blue tile, and some levels require a specific amount of gems to be collected as well. 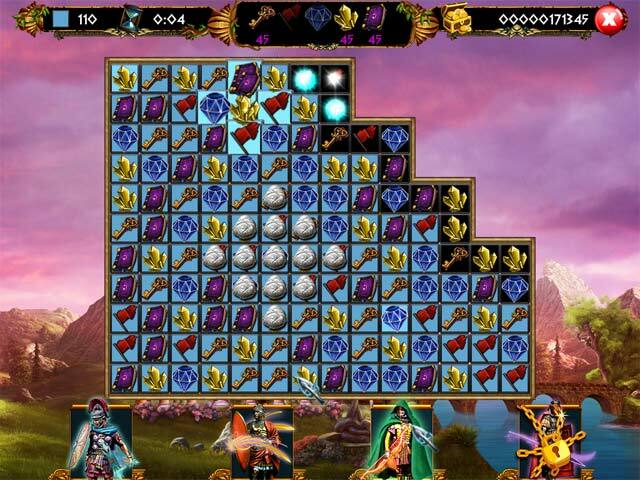 The tiles aren't that colorful, but most of them deal with the time period with swords, flags, gems and wings. I didn't see an option to play this Match 3 game in another mode such as Untimed or a different matching method, but the goals are fairly easy to accomplish within the given time frame. Enjoy! Rated 5 out of 5 by twtscat48 from Enjoyable match 3 game I liked this game, the graphics were very good. You move from one place to another once you clear the board. It's a good paced game not too fast not too slow. The only negative thing is I have a larger screen on my computer and there is no setting automatic or otherwise to have it fit my screen. I recommend this game otherwise. Rated 4 out of 5 by melissa845 from Game Deserves a Higher Rating I found it to be a classic adventure type match three. Lots of fun.... not so hard...yet anyway. I have played for about two hours and so far it has kept my interest. I used to play only the games with high ratings but I find there are still a few gems out there that no one seems to have noticed. See what you think? 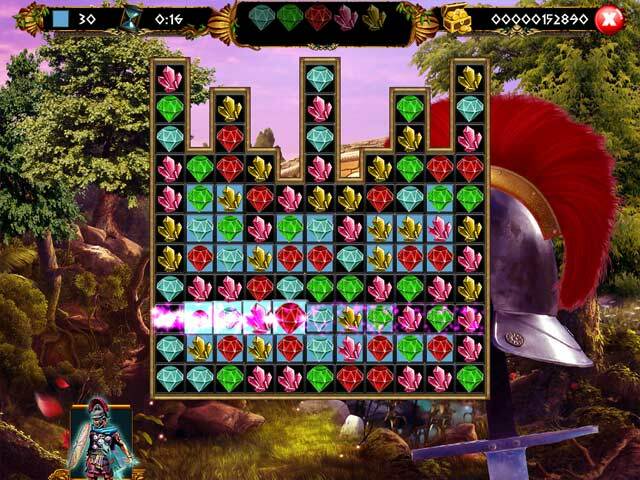 Rated 4 out of 5 by deddu from Uncomplicated Match 3 If you like straight match 3's this game is for you. There are 100 levels. You are on a journey to find Marcus and save your wife. The game isn't time, but you can complete most levels in under 3 minutes and receive a "time bonus" You collect money to buy soldiers to help you. Each time you use them, it will cost you from $4,000 to $15,000. There are the typical chains, double chains and rocks. If you match more than 5 to obtain lightening and a fire bomb. Rated 4 out of 5 by Piperfoxx from No Extra Play I enjoy this game, it doesn't have the kiddie play that comes with alot of these kind of games. Though I have 2 problems which I would like to fix. One; I can't turn the HINT OFF. ( I really dislike that) Two, The screen can not be sized like ( Bejeweled ) I use Laptop at night half screen game other half searches. Rated 4 out of 5 by splitnajlipsi1 from FUN GAME FOR ONE HOUR BASED ON FREE TRIAL, BUT SO FORTHIT TO PLAY.